What a barrage of Nexus S news today! 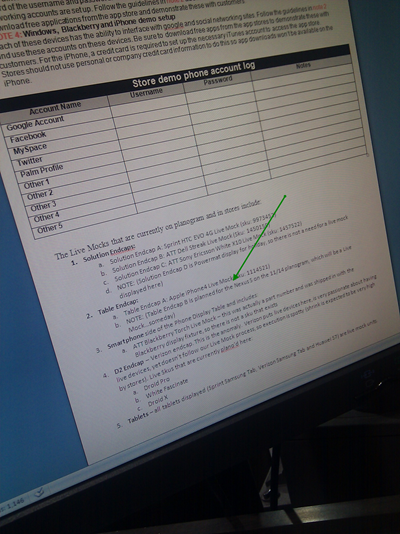 First, a brief appearance at Best Buy, then an actual picture of the new Nexus on BestBuy.com, confirming it will run Gingerbread, and now we have a supposed snap of the Best Buy internal Live Mock memo, showing, among other things, the Nexus S getting a dedicated endcap on the November 14th planogram. It doesn't look like it is going to be a live mock just yet, which means it will either contain a dummy unit or various Nexus S promotional material and information. The picture was taken by @anrblog, who claims he persuaded a Best Buy employee to allow him a quick glance at their system. It does look credible, but I don't see Best Buy attribution anywhere, so take this rumor with a grain of salt. One thing is for sure - the Nexus S is real, and it's coming soon - so soon that we can almost smell that gingerbread.